How can I add even more value to my clients than I currently already do, so they can innovate and become market leaders in their niche? This positive and constructive question has forced me to find new ways of innovating from within and increasing sales and profitability for the clients I work with. The particular problem I was looking to solve was how I can reduce customer acquisition costs for my clients, and make their marketing dollars go a lot further than it currently is as a way to prove that digital really works. A lot of my clients still spend a fair chunk (over 50%) of their marketing dollars on traditional offline media, with dwindling returns. Knowing the importance of psychology in marketing I started thinking about Social Proof. Social proof is the concept that people will conform to the actions of others under the assumption that those actions are reflective of the correct behaviour. Thanks to social media, social proof has gained steam over the past few of years, but in truth it’s been around for a quite a while in marketing. Now adding smartphones into the equation has provided unparalleled access to the Internet with consumers spending most of their time on social media and online messaging platforms. This has enabled consumers the ability to publish, consume content, research, share and speak openly about their experiences with brands, products and services. This is both exciting, if your organisation provides an exceptional customer experience, and scary if you know you have some gaps in your customer experience or product offering and don’t know what your customers are saying about your business and where. So this is the backstory of how I put together an very effective review strategy for my franchise clients, and they are absolutely crushing it for the small investment. In this post I’ve taken a deep dive into Online Reviews, Net Promoter Score and Customer Feedback Programs in general, and how to implement one successfully to gain leverage on the growth and profitability of your organisation. Of course I have predominantly focused on the online experience as this is where the future lies, as traditional media is rapidly dying. Positive online reviews can increase Click Through rates by up to 69%. Social proof, provided by peer-to-peer recommendations of products and services, is a powerful way to persuade your potential customers. The report goes on to underscore the importance of reputation marketing, and why businesses need to look to reviews for continued growth. On top of the stats above, online reviews and ratings are on the rise, with 53% of consumers searching for local businesses at least one time per month (vs. 43% in 2015). Still asking why online reviews matter? How about, “because Google says so”? Google has given us yet another reason to put our reviews where our mouths are. In Google’s markup—the annotated content that appears in search—of a company or product, reviews and ratings can now be included. “When Google finds valid reviews or ratings markup, we can now show a rich snippet that includes stars and other summary info from reviews or ratings” (Google Developers). This is big news! 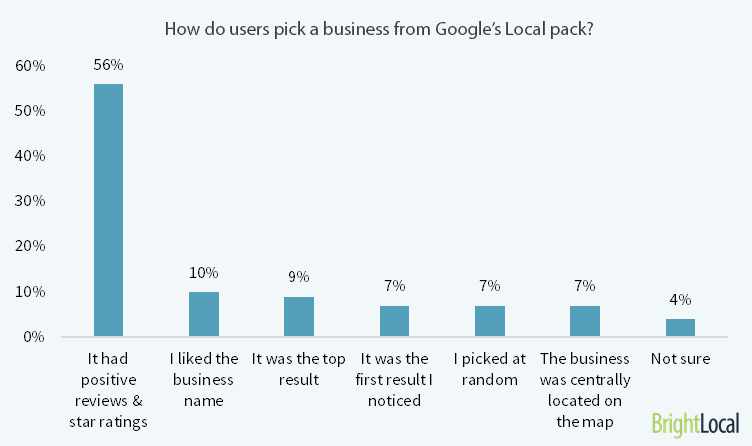 If the above statistics don’t sway you, just look Google’s most recent stance on local ranking factors. Relevance: Relevance refers to how well a local listing matches what someone is searching for. Distance: How far is each potential search result from the location term used in a search? If a user doesn’t specify a location in their search, Google will calculate distance based on what’s known about their location. Back in 2011 Google conducted some extensive research and published a study called the Zero Moment of Truth or ZMOT. ZMOT talks about the consumer journey, specifically online, which really puts things in perspective when considering why we should be looking at using reviews as part of our overall marketing and customer experience (CX) strategy. 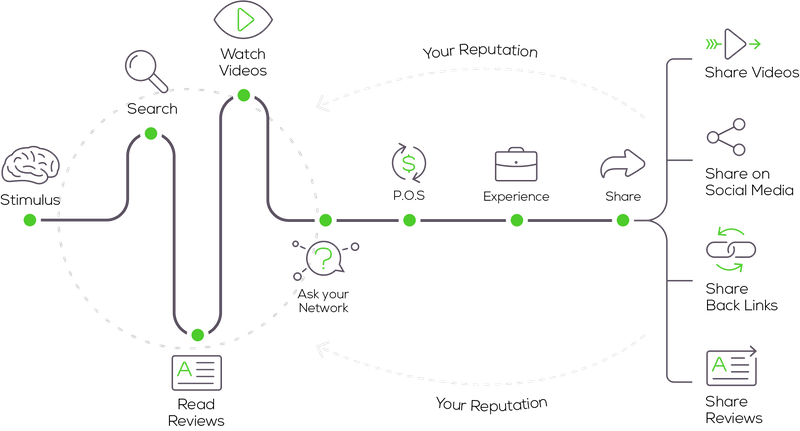 The diagram below shows the user journey, from left to right, when making a purchasing decision, and specifically highlights the importance of reviews in this journey. We know that customers pay attention to online reviews, but do these reviews help build trust? And how would leveraging and promoting a business’ great reputation help improve their online marketing efforts? Brightlocal recently conducted a survey to see how online reviews impact a consumer’s trust and how promoting a 5-star reputation impacts landing page conversions. The panelists were asked to imagine they were searching online for a local plumber, florist or realtor. We showed the consumers two landing pages – one page that highlighted an actual customer’s review about the business and another page where the business said they were the “dependable” company. For this research study, Brightlocal tracked whether consumers picked the businesses with or without the customer review on the landing pages. Additionally, they asked consumers to give feedback on a variety of other factors that impacted their decisions and opinions of these “sample” businesses. 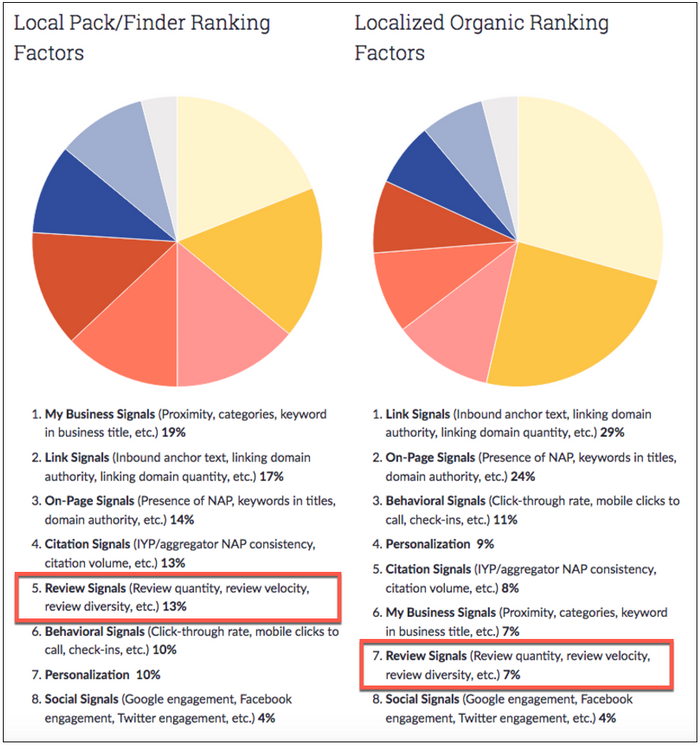 They looked at the Impact Reviews Had On Consumer Trust and Landing Page Conversions. To test the trustworthiness that reviews have on consumers Brightlocal showed consumers two landing pages for each industry. One of the pages showed a picture of a real customer and their actual 5-star review about the business. 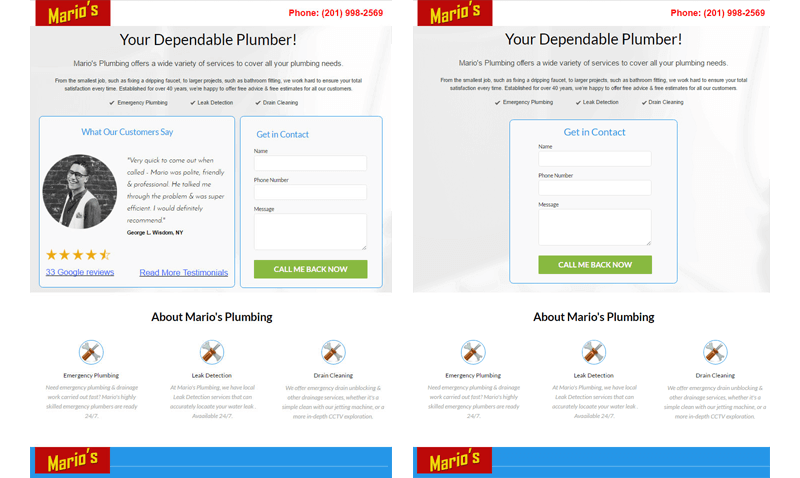 The second landing page displayed a “Your Dependable…” page where the business promoted their “dependability” – but without any user-generated reviews. Next they asked consumers how trustworthy they thought these two companies were based on the design and content of the two test landing pages. In the results of this question, 83% of the people thought the business with the user-generated review on the landing page was trustworthy. 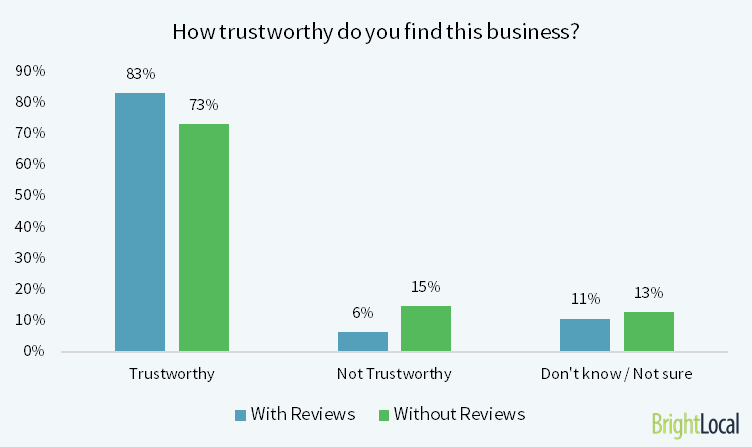 Additionally, 15% of the people said they did not find the business without reviews to be trustworthy. This is important because it shows that the pages with real reviews from customers created a more trustworthy feel from the participants. But did it make them more likely to contact the business? 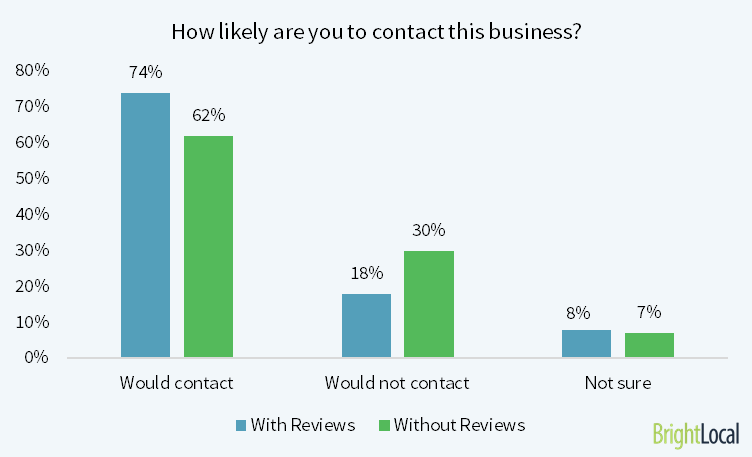 These results are especially important for businesses because it shows a direct relationship between online reviews and the perceived trustworthiness of your business. The consumers surveyed equate online reviews with the business being one they can trust. In a world of mixed messages, a lot of options and overwhelming data, getting online reviews is a great way to differentiate your business from your competitors in the market. Reviews also promote trustworthiness in potential new customers. According to research by Search Engine Land, 69 percent of consumers believe that reviews older than 3 months are no longer relevant. Approximately 15 percent, meanwhile, believe that the only relevant reviews are the ones written within 2 weeks. 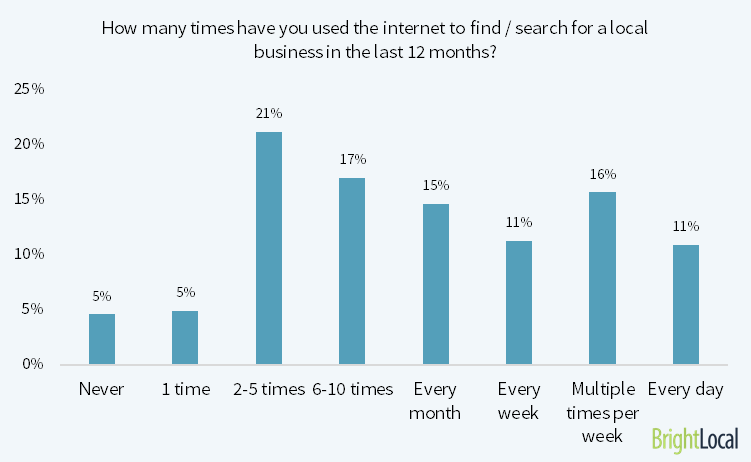 This emphasises the importance of needing to have a strategy in place to consistently generate online reviews. If you want to generate online reviews, then there needs to be a place for customers to post them. For example, if you want to garner a lot of positive reviews on Google My Business, you need to make sure that you have set up a profile. This is especially important for a platform like Google, because ‘claiming’ your business will allow for online reviews to be shown in search engines. This concept applies to most 3rd party review sites. Plus, in most cases, even if you don’t need to have a profile to collect online reviews, you’ll still want to make sure that you have one anyway so that you can respond to feedback whether that be positive or negative. Once you’ve identified where you want your reviews to be left, make sure that you collect a link to that location. You’ll then be able to provide that link to your customers when requesting a review – reducing the amount of effort your customer needs to go through, and making them more inclined to post their feedback. If you want to generate more online reviews, then pro-actively asking for reviews in the first place is key. This should be setup automatically so there is little to no manual input required from you. The only downside of this approach is that if you have unhappy customers you will also attract negative reviews, which will get published straight onto 3rd party review sites. The alternative, and one that we prefer is to request feedback from customers from a proprietary system, which allows us to keep the negative reviews offline, and post the positive reviews online. it works much the same as 3rd party review sites, but instead of an email asking for feedback on your Facebook or Google My Business page directly, it asks for feedback into a proprietary system, which allows you to set up more sophisticated workflows. Your customer receives an email asking for feedback which takes them to a special URL hosted on a proprietary platform. They leave a star rating, and also comments if they choose. If the review was positive, over say 4 stars as an example, then the workflow built into the software will ask the reviewer if they would also like to paste that same review on Facebook or Google My Business or any other 3rd party platform that you have setup a profile on. So if they choose yes to a 3rd party platform then you have just collected 2 reviews. The first review will be published on your website with review schema (great for SEO rankings, this is also fresh user generated content) via a widget that pulls data from the proprietary platform, and the second review will get published onto the 3rd party platform that the reviewer chose, Facebook for example. If the reviewer leaves a negative review, lets say under 4 stars, then the software workflow can ask specific questions about price, service, quality or any other question you wish to create in order to obtain more specific feedback on how you could improve. Now the real benefit next is that the software workflow will NOT ask the reviewer to leave this feedback on any 3rd review sites, thus keeping your brand in tact. The beauty of systems like this is that you can amplify the positive reviews by publishing them and requesting 3rd party sharing, and yet still collect negative feedback as a way to improve your business without worrying about it showing up online. These systems typically integrate directly into your Point of Sale (POS) via API and automatically send out notifications and followups requesting feedback from customers. Even if you’ve set up a location where online reviews can be left and you’ve solicited a customer review, there’s still a chance that the majority of your customers will choose not to. In a situation like this, you might think that providing an incentive for people to leave an online review is the way to go. However, that’s not necessarily a good idea – especially if you’re incentivising your customers to leave feedback on a 3rd party review site. That’s because many 3rd party sites are very strict when it comes to how businesses can ask for reviews. Should it be discovered that you have been actively incentivising reviews, there’s a good chance that you might lose all of the organic reviews that you have built up over time. You might even get fined, if you decide to offer incentives for reviews or are leaving fake reviews. Something like that could obviously do a lot more harm than good in the long term. So…make sure that you check the rules of a 3rd party review site before you do anything. And, maybe even stay away from incentivising in exchange for reviews. Improved Click Through Rates (CTR) from users who find you in search results. So now you know why reviews are important, and how getting them online can accelerate the growth of your business. Now lets take a look at NPS. Most businesses track their online reviews religiously yet they have no metric to assess an even more important marketing tool; word of mouth. Despite its significance, many small businesses either weren’t aware or found it too difficult to measure this important growth metric. Net Promoter Score (NPS), familiar to most Fortune 500 companies, is just such a measure and it is increasingly available to local businesses. The NPS survey, by design, is crafted to calculate how well you are doing amongst the subsets of your customers most ready and willing to affect your word of mouth marketing. The NPS survey asks just one question; How likely are you to recommend us to a friend or colleague? It then allows the customer to signal how likely their word of mouth potential by rating this question from 0 (not likely) to a 10 (very likely). The methodology of Net Promoter Score evaluates the 0-10 answers not by a simple average of your over all customer service but rather by looking at the two poles of your customers; those that love you (promoters rating you a 9 or 10) and those that found your service lower than average (detractors rating you a 0-6). These two groups are the most likely to either encourage or discourage others from frequenting your business. See the diagram below for a visual representation of how NPS is calculated. For those of you who are new to NPS, lets also clarify how an NPS score is calculated. The score, on a scale of one to 10, falls into three groups. Promoters: If a customer scores you as a 9 or 10, they are promoters. Passives: If they score you as a 7 or 8, they are passive. You don’t know if they are leaning toward loving you, leaving you, or they just don’t care. Detractors: And, a score of a 6 or lower means you have a detractor. 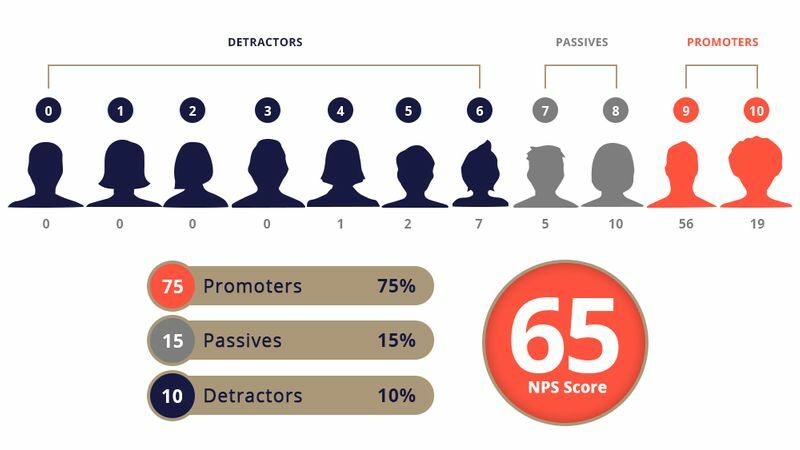 To determine your official NPS score, take the percentage (%) of promoters (9s and 10s) and subtract the percentage of detractors (6 and lower). That number is your Net Promoter Score. In the diagram above we have 75% promoters, less 10% detractors, leaving us with a NPS score of 65. A more detailed look at the 3 groups so you can gain the most out of NPS. Promoters rated you a 9 or 10 on the NPS question. As the category name implies, these are your customers that will promote your business by telling others they should buy form you. In real life, this is a customer so happy they might even tell others about your business when they haven’t even been asked about you, your service or product. They are often referred to as your brand advocates. Remember when your neighbour walked into the last neighbourhood pool party and started telling everyone about the company that just painted his house? He raved how they were affordable, meticulous and so easy to deal with. That’s a promoter, marketing for you with their opinion of their great experience. Passives rated you a 7 or an 8 on the NPS question. Your business met their expectations, but it didn’t “wow” them. They have nothing or little bad to say about you, but they aren’t confident they want to vouch for your business by telling others. In real life, you might be talking to a co-worker that tells you about the resort he just stayed at on vacation. When you asked how the place was, he said “it was ok, nothing fantastic, nothing bad … I might try another place next time.” The business captured their money once and might see them again but likely won’t do business with any of their friends. Pro Tip: As you’ve just learnt, this category is left OUT of the NPS formula. But do not skip over this group of customers. Analyse this group and figure out how you can move some of them up to being a promoter to grow your business. Just as important is making sure these “passives” do not dip down into the next category we’ll look at. You can’t please everyone, but you sure can try to develop raving fans of your business. Detractors rated you somewhere from a 0 to 6. In your customers eyes you fell short, maybe by a few inches and maybe by a mile if they gave you a zero or one. This category is the opposite of a promoter as instead of singing your praises, they might be telling their friends, neighbours and co-workers to avoid you at all costs. In real life you meet up with your best friend for a drink and after small talk he asks you if he told you about his current real estate agent. He goes on a 10 minute rant on how his Real Estate Agent never takes his calls, only follows up days later after multiple calls and emails and then messed up some paperwork causing them to waste another 2 hours on his day off. He’s not going to use or refer that Real Estate Agent to anyone, you won’t use them either. You won’t be the only one he tells this story to. Detractors are exactly that, they are taking business from you. This is one hole in your bucket you need to fix quickly, so that all your expensive marketing efforts are not going to waste. Reviews, since their appearance on the scene in the early parts of the decade, have certainly increased in importance in the form of digital word of mouth. New customers can learn about your business by reading reviews on Google, Facebook and other platforms, but research in 2012 and earlier found that as many as 85% of new customers acquired by small business came via traditional word of mouth. In my more recent consumer research I found that two and a half times as many people found their lawyer (as an example) through asking family, friends or a work colleague than through the next most popular source, the internet search where reviews play an important role. There are certainly indications that younger consumers are increasingly reliant on reviews but word of mouth continues to be the leading way to find new customers. Humans, being social creatures, will very likely continue to tell those closest to them of their experiences, so word of mouth referrals will continue to be a huge driver of your new customer sales. The Net Promoter Score creates a single score, by looking at your promoters and detractors, that is effectively a word of mouth index for your business. And given that it correlates well with future sales you should be thinking about NPS as one of the most important metrics for your business. Best of all, we’ll help you start capturing it for your business. Simplicity. As I’ve outlined already, NPS is easy to understand and easy to start. While complex surveys offer up more information, it can become overwhelming trying to evaluate open ended feedback. Consistency. Your NPS serves as a consistent and common goal among your business and team. Easily understood, evaluated and then communicated by owners, management and staff – it’s a great way to get everyone on the same page. Tracking. Your Net Promoter Score can be benchmarked and tracked over time. Whether you work to improve your NPS month over month or quarter over quarter, you have the ability to see where you are at now and work to get better (Our reporting tracks this for you). Interestingly, our data based on thousands of customer interactions shows that business with higher NPS scores get more testimonials and online reviews. A high level of customer service doesn’t happen by accident. You choose how to engage, communicate, service and follow-up to please your customers. Once small business owners are aware of how easy Net Promoter Score is to utilise and get started with, they make the choice to start capturing and measuring NPS to help them improve their business. At sub scale, it is difficult to impossible to be better on all these dimensions and have any sort of a sustainable business. The interesting question is if you pick two dimensions to be better and one to be worse, how would that impact NPS? Looking at change in NPS as you test different features or pricing is potentially more telling than absolute NPS on its own. Now that you understand the value of gaining Customer Feedback in the form of Reviews or Net Promoter Score (NPS) you need a strategy to execute. Just not a priority right now (again this shows a lack of understanding due to the low cost and high ROI short term and long term strategy to stay ahead of consumer demands and competition). All three of these points are even more of a a challenge for multi-unit organisations, yet also easily overcome when you have a solid strategy and systems in place for your specific business. Below is a breakdown of what you need to consider when building your Feedback / Net Promoter Score or Review strategy. How will you use the feedback to improve your business, processes, staff or products? What information are you seeking to gain in the feedback request? What frequency will you send feedback requests out, daily, weekly, what volume? Do you understand the importance of Net Promoter Score (NPS) as a customer experience management tool/indicator? How will you segment positive feedback from negative feedback? What platform will send and receive Customer Feedback emails? How will you control which feedback or reviews are published online or not? What will be your follow up/response strategy to both positive and negative feedback? Will you be looking for feedback submissions at Point of Sale (POS)? 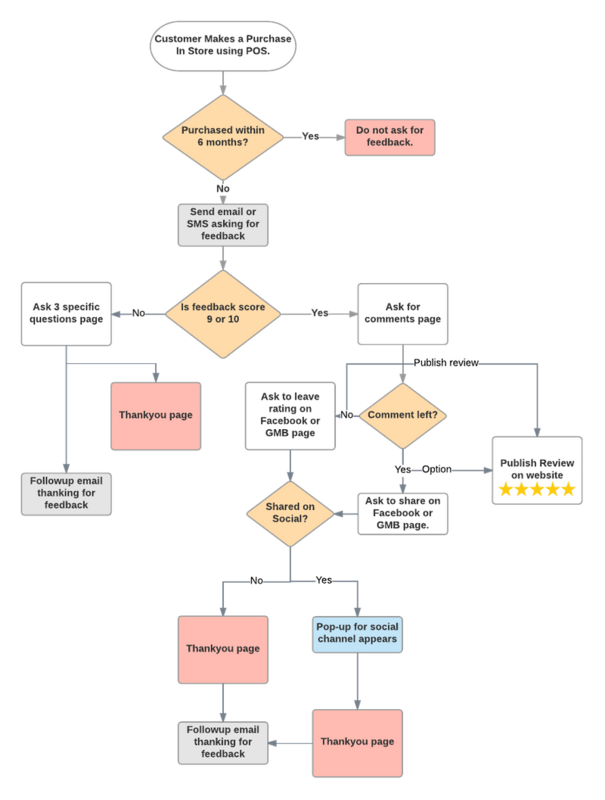 In the diagram below I have illustrated a typical workflow that my clients use to gain maximum leverage on their review and NPS strategy. Franchisees or locations typically don’t have access to the main company website, so installing reviews widgets from some of the tools we use cannot be done without the input from head office. Franchisees or location managers don’t necessarily have the time, skills or interest in managing things like this, so whilst a small number will do, and do it well, most 80%+ will not follow the strategy. This is then leaving massive opportunity on the table for the brand overall, as the ability to dominate in local search as well as positive feedback is being restricted. The only way I have been able to make a strategy like this work properly for multi-units and franchise groups is to have head office sponsor and manage the program centrally. This doesn’t mean that head office needs to do all the work, but it does mean that they need to sign off on it, and be responsible for it. Typically myself and my team will do all the work, including running educational webinars and presenting at national conferences to upskill the franchisees or local managers. This also allows central reporting to be fed back to head office which is accurate and transparent. This approach alone has enabled us to double revenue for an organisation over a 12 to 24 month period alone. Online reviews have moved from “nice to have” to essential. As customers look to these sites for feedback; updating profiles, responding to reviews and engaging customers becomes increasingly more important. Maintaining positive word of mouth online is digital age customer excellence. In 2016, local businesses were spending $80B on digital marketing solutions and services, with reputation management boasting $1.3B of that chunk, up 216% from 2015 (Borrell). Social media marketing will be up a 248% from 2015, taking up $2.2B of the pie. While online reviews have been prevalent for many years, business owners and consumers alike are now recognising the gamut of challenges and opportunities. Moreso, franchise groups and multi-unit brands can leverage NPS to drive healthy competition amongst the network and improve overall brand perception which ties in with branding for the entire group. To discuss the specific solutions I have developed for Franchise groups and multi-unit organisations, contact me today for a confidential discussion.